“I wrote this book to encourage you to believe in yourself. You will get a job,” Nancy Schaefer, President, YES. ► Good Job!… Written specifically for youth. ► It’s cool and practical. ► Straightforward, expert advice, plain language… all the basic information to find a job. ► It’s easy to read. Good Job! has tips, checklists, do’s and don’ts. ► Young people helped the author, Nancy Schaefer, to ensure Good Job! is youth focused. ► Good Job! is youth friendly and easy to read. ► Good Job! understands the difficulties youth face in entering the job market. ► Good Job! is a resource book in the Grade 10 Career Studies course in high schools across Ontario. ► It’s the perfect book for parents with teenagers. ► As President of YES, Nancy Schaefer is an expert in the field of youth employment. I’m young and full of energy. I’m creative and have fresh ideas. I feel like I can do just about anything. NANCY SCHAEFER is President of Youth Employment Services YES, Canada’s first youth employment counselling centre established in 1968. Under Nancy’s leadership, YES has grown into an award winning Centre of Excellence for Youth Employment and Empowerment serving well over 100,000 youth. Nancy has been a tireless advocate for youth employment and entrepreneurship for more than 20 years and appears frequently in the media to remind the public of the important role young people play in our workplaces, our communities and the economy. We thank The Atkinson Foundation, The McLean Foundation, The Raptors Foundation, the K.M. Hunter Foundation, The Counselling Foundation of Canada and Stoddart Publishing for supporting Good Job! NEED A JOB BUT HAVE ALMOST NO WORK EXPERIENCE? WORRIED THAT YOU WON’T GET A JOB BECAUSE YOU’RE YOUNG? ► Find the jobs that interest you. NOT INTO WORKING FOR SOMEONE ELSE? HAVE AN IDEA, A DREAM, OR A PRODUCT YOU THINK YOU CAN SELL? THINK YOU’RE READY FOR YOUR OWN BUSINESS? ►Make your entrepreneurial dreams a reality. Developed with advice from employment and business experts and young people like you, Good Work! is full of tips, dos and don’ts, checklists, and questions and answers. So start here and prove that being young is an advantage. To purchase a copy of “Good WORK!”, click here or go to your local book store. Memorial University of Newfoundland, St. John’s, NF. the knowledge and skills to seek employment or to pursue an entrepreneurial dream. 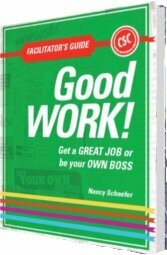 The guide offers those who are facilitating this learning suggestions and strategies for using the information in Good Work! Get a Great Job or Be Your Own Boss: A Young Person’s Guide (link to good work book) to assist young people in acquiring the skills necessary to allow them to proceed on the path to career success. Facilitators should access appropriate sections to meet the learner’s needs from the suggested strategies, models of worksheets, and templates. ► Qu’est-ce qu’un emploi à temps partiel? ► Comment faire en sorte que mon CV donne de moi l’image que cherchent les employeurs? ► Comment faire du réseautage? ► À quel moment « parler d’argent »? ► Est-ce que je souhaite être mon propre patron? ► Comment réduire mes coûts de lancement? etc. Tous les chapitres comportent à la fin des rubriques intitulées « Conseils et erreurs à éviter… » et « Où trouver de l’aide supplémentaire…? », ainsi que des exemples, le cas échéant (exemples de CV, de lettres de motivation, de publicité, etc.). Des encadrés intitulés « ASTUCE(S) », « LE POINT DE VUE DE L’EMPLOYEUR » et « BON À SAVOIR » mettent en relief certains points importants. Les principaux sujets traités sont, pour la recherche d’emploi : l’utilité d’un emploi et les différents emplois envisageables, la préparation à la recherche, l’utilisation d’un formulaire de candidature, d’un CV et d’une lettre de préparation, la préparation et la participation à une entrevue d’embauche et la réussite au travail. Les principaux sujets traités sont, pour la création d’une entreprise : comment exploiter une bonne idée, le montage d’un plan d’affaires, la recherche de financement, le marketing, l’exploitation d’une entreprise et les comportements adéquats pour réussir dans son entreprise. Ce livre s’adresse aux adolescents et aux jeunes adultes, en fin d’études secondaires ou ayant achevé ou quitté leurs études, à la recherche d’un emploi ou qui se sentent prêts à démarrer leur entreprise.